It was the title’s unusual quality that drew me to it. I wanted to then read it and find out more. What was the book about? Why this title? I was guessing that it would be a love story for sure, however I did not for once think it was a love story of a father and his daughter. Of the relationship they share and what they don’t and how their love comes to be and what they learn from it over a period of time. That in brief was the essence of “Ten Things I’ve Learnt about Love”. “Ten Things I’ve Learnt about Love” may seem the usual run of the mill dysfunctional family story; however let me tell you at the very outset, that it is not. The story is about belonging and wanting to really badly and yet staying away from it. 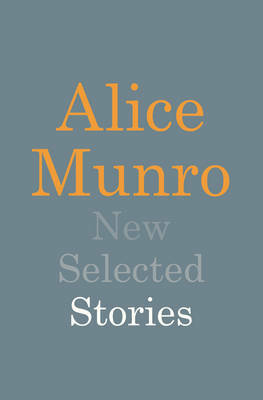 Alice has just returned to London after travelling abroad and come home to her father who is living at the pity and criticism of her two older sisters. She has never felt close to him and now everything seems different and new. Daniel her father is the other central character who is living homeless, from one shelter to another, and desperately looking for someone all these years. The story shifts between both their perspectives all along the book. The dual narrative style completely worked for me. What I loved was the way Sarah Butler at some point made their lives overlap and make sense of the entire book. The novel’s every chapter starts with a list of ten things, about various things of life and those were my best parts of the book. More so, the book seems to be a love letter to the city. London forms a major part of the book, almost a third character which is described beautifully. As a reader, all I wanted to do after reading the book was catch a plane and visit the places she mentions. It is very difficult to believe that this is Sarah’s first book. It is detailed, vivid and almost magical in its scope. It is about regular people and beautiful lives that twist and turn and how somehow one manages to make sense of it all. The book is gradual, subtle and absolutely stunning. It will definitely stay with me for a very long time with its unusual format and the usual miracles of love and happiness. 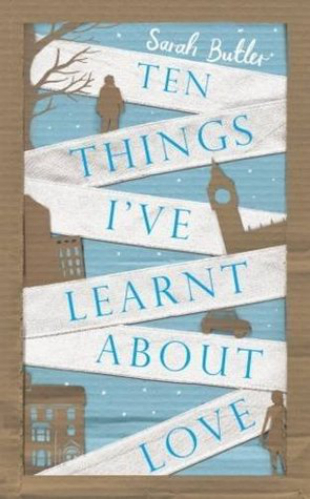 This entry was posted in Books, Literary Fiction, Picador, Review and tagged daughters, family, fathers, Love, picador, Sarah Butler, Ten Things I've Learnt About Love on April 30, 2013 by thehungryreader. I believe in discovering books on my own. I do not believe in recommendations because I am scared that most people do not know what I love to read or do not care to ask. It is a fact. Most people just put a book in your hands and tell you, “You must read this.” There is nothing more to that interaction. And yet there are times when I am completely taken in by a recommendation and love it to the core. This was the case with, “Following Fish” by Samanth Subramanian that was highly recommended by a dear friend and rightly so. “Following Fish” is a lot packed in one book. It is about food and about travel and about empathy and about different cultures existing in one country, which is India. 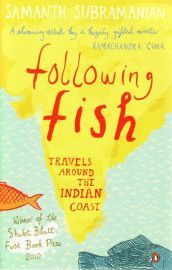 Subramanian travels the length and breadth of the coastal parts of the country and discovers Fish, right from how the process of catching fish goes on to the making and to the cultures that influence this category of “sea food”. What I loved about the book was its simplicity of language and at the same the core remained intact. Not at any given time does Samanth move or change tracks rapidly. Even his travels were planned and thereby the writing that emerges is fantastic. The writing is easy and not at all taxing. In fact in most places it is even funny given the nature of a travelogue when infused with food at its core. He speaks of tragedies such as tsunamis and he also talks of happy times. In the most basic way, the balance is created and maintained. My most favourite part in the book, but obviously had to be about Mumbai and its fish. About how fish is revered in the city and what place does it have. What I also found most endearing was the way Samanth combines history with all of this. I am a firm believer in the concept of the past and how it links to everything we are made of, so this worked for me superbly while reading the book. The good thing is that this book reads very simply so and at the same time speaks of so many different things. A read if you love to travel or love food or love both. This entry was posted in Books, Non Fiction, Penguin Books, penguin india, Review, Travelogue and tagged Fish, Following Fish, food, penguin india, Samanth Subramanian, travelogue, Travels around the Indian Coast on April 28, 2013 by thehungryreader. It is never easy to write about the world the way it is. To talk of love and friendships and everything that takes place in between is never something that can be done without wrenching the way you feel about them. I have always admired writers who can manage this and continue to do so, because it takes a lot out of the writer to dig in and generate stories that resonate long after you have finished the book. Books that speak of growing up and its challenges and make me realize how I feel about the way things are, manage to be very close to my heart, and one such book that I have read off-late is, “The Interestings” by Meg Wolitzer. “The Interestings” begins kind of slowly, almost letting you see how things got to where they did. However once that is shaken off, the book somersaults into various kinds of emotions and that is where the narrative is the strongest. The writing reminded me of Virginia Woolf and Elizabeth Bowen – more so because of the back and forth in time, almost linear in narrative and sometimes just spellbinding. It is a chronicle of four decades and the lives of six strangers who become friends at a summer camp in the seventies and how their lives change every year after that. The narrative and action takes place mostly in New York and that is another charm of the book. This is the basic plot of the book and as the adage goes, there’s more to what meets the eye and it could not get truer for this work. I had never read anything by Wolitzer before this one, but I sure will now. The references throughout the book of the decades gone by are extremely interesting. What is even more interesting is how she manages to stick her story inside all of this and make each and every character stand out. She speaks of the rituals of childhood, the dilemmas of adulthood and how when middle-age takes over, it comes with envy in its wake. The writing is dynamic, with a lot happening on almost every page and maybe that is one of the reasons I wanted to put it down and take in every word page by page and moment by moment. The various friendships forged throughout the book just reminded me of my relationships and people who I have held close for years. It also reminded me of friends who have drifted away. That is the effect of this book. It not only makes you think, but also feel. The subject matter of the book may not be original – since it is about friendships being forged and then not working out at some level, however the way Wolitzer writes is something very unique and brilliant. The writing is economical and yet the expressions aren’t. Wolitzer manages to capture the essence of every single emotion. From a successful couple to a one who is not so and how their friendship takes on its own form and shape. The novel provides various insights and various perspectives and that is something which is hard to miss. Each character has his or her voice and that helps a lot as you turn the pages. It is not a story told from one perspective or a single person, which I loved the most about this one. 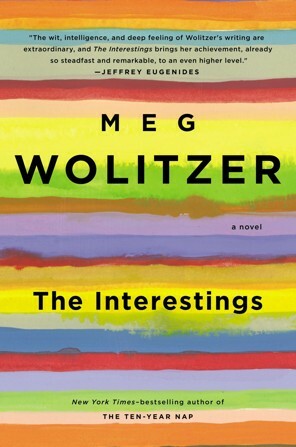 “The Interestings” title comes from the fact that the six friends do not want to be boring and Wolitzer ensures that for the reader at every single page. Characters are forever growing in this one and that is what makes the book so unique. The cover of the book is retro and says a lot and connects wonderfully to the plot. A must read for all. I totally recommend this one wholeheartedly. This entry was posted in Books, Literary Fiction, Penguin Books, Review, Riverhead Books and tagged Friendships, literary fiction, Meg Wolitzer, new york, penguin books, Riverhead Books, The Interestings on April 27, 2013 by thehungryreader. It is not easy to write a book which is solely based on geography or for that matter history. What is most difficult is when the two get combined in a book. More so when the country in question is India, with its diversity and centuries of culture and history, which can still be seen in most places, if only you would look at it closely enough. I have always been intrigued by our country’s cultural subtext and how we came to be as a nation. The thought would be there and I wanted to read more on it, till something else caught my attention and this thought would then be on the back burner. 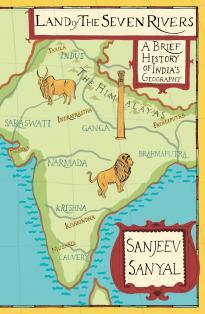 Till I heard of “Land of the Seven Rivers” by Sanjeev Sanyal and decided to give it a shot. There is a danger when you want to read a non-fiction title. The danger of boredom that is. It is very easy to lose interest in a book based on facts and numbers. However, this did not happen while I was reading this book, maybe also because I took my time with this one. I had to let the history and geography of our land sink in and that helped me savour the book – page by page. “Land of the Seven Rivers” by Sanjeev Sanyal is a fantastic attempt to talk to us simply about our heritage (well so to say) and of the times gone by. The book uncovers thousands of years of history and also manages to link it to the dramatic and quite sudden changes taking place in the country. He speaks of the architectural design of the country and how with the many rulers, the landscape changed and with some of that, our culture and history as well. I love the parts when Sanyal tries to uncover questions we may not even think of, for instance, why is India named Bharat? What happened to the Saraswati River? He speaks of the Great Flood and ties it back in with the structure of the country. What I liked is that he doesn’t trace kingdoms, instead he traces civilization during those kingdoms – he speaks of lives and then connects it all to the geographical nature of the country. My favourite parts in the book have to be how he explains the archaeological sites and how they came to be. The maps only add to the beauty of language and wit as displayed and they are needed to guide the reader at every turn of the page. I can only say that as a student I loathed history and as an adult I am loving it even more and I am only thankful to books like these that have opened my mind and world to what once was. I would recommend it very strongly if you want to know the roots of our nation. This entry was posted in Books, Non-Fiction, Penguin Books, penguin india, Review, Viking and tagged culture, history, India, Land of the Seven Rivers, Non-fiction, penguin books, penguin india, Sanjeev Sanyal, viking on April 27, 2013 by thehungryreader.